The death of Hamed Shamshiripour has rocked the Manus detention centre. Hamed, a 31 year-old Iranian refugee, was found hanging from a tree on 7 August behind the school, near the East Lorengau Transit Centre. Hamed’s death is the fifth at the detention centre, and comes at the same time that Australian Border Force and PNG Immigration are trying to drive refugees out of the detention centre with forced closures of compounds. A shocking history of abuse and mistreatment surrounds Hamed. His mental health had seriously declined. Even in 2015, when he was brought to Melbourne for medical treatment, he requested help for his mental health but was returned to Manus, where his mental health deteriorated badly. His distressed behaviour led to him being jailed and repeatedly beaten by PNG police. In January this year, he was released from jail and placed into the East Lorengau Transit Accommodation. The government denies all responsibility for Hamed’s death. They would not even notify the family that Hamed had died. But like the four others, Hamed has been killed by a detention system that was established, funded, and administered by Australia. There is more blood on the hands of Turnbull and Dutton. The government can’t hide behind the argument that they are saving people from drowning at sea. It is deliberate government policy that is taking their lives. But Turnbull explains it is not that the boats come from “certain regions”, Australian policy bans anyone who arrives by boat. Trump is impressed and thinks being worse than him is a compliment. But as incredible as it seems, on refugees, Turnbull is worse than Trump. In fact Turnbull started the conversation emphasising an earlier discussion with Trump’s son-in-law, Jared Kushner, about how Australian policies had informed the immigration policies of the Trump administration. Trump came to power promising to build a wall between Mexico and the US. Turnbull already has a “wall”—a naval blockade between Indonesia and Australia—that is ruthlessly policed to repel asylum seekers. Turnbull is revealed as callous and hypocritical. Turnbull tells Trump, explicitly, that the agreement with the US, “does not require you to take any.” And when Trump questions why 2000 people are imprisoned on Manus and Nauru asking, “Why haven’t you let them out,” Turnbull says Australia knows everything about them and they are not bad people. The transcript makes sickening reading as Turnbull both grovels and boasts to Trump of how alike they really are. In the process the US deal is also exposed as a shabby trick. But it also reveals the significance of the fight against Turnbull. When Trump is taking inspiration from Australian refugee policies there is every reason to redouble our efforts to end detention, end the turn-backs and fight to bring all those on Manus and Nauru to Australia. Meanwhile on Nauru, disappointment and despair has turned to anger as the hopes of resettlement in the US have been snatched away again. 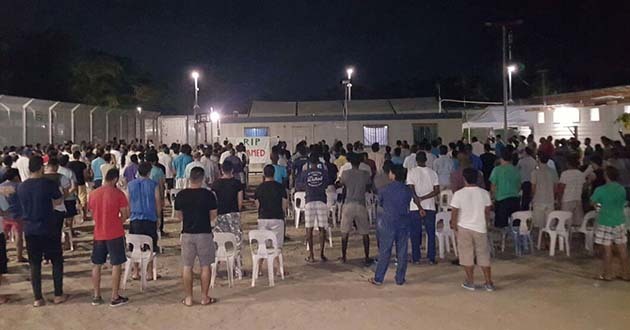 Protests have spread from the gates of the refugee settlements to the detention centre and, significantly, to immigration offices at Beach House and to the OPC 1, the administrative centre of detention operations on the island. The OPC 1 protest struck a nerve. Five people were arrested and beaten when police attacked the peaceful protest on 8 August. On the night of 8 August, a transport bus was burned at the OPC 1 gates. A hastily convened court on 9 August (the day after their arrests) convicted and jailed four of the refugees on charges of unlawful assembly for 14 days.